Food Can | How can I recycle this? 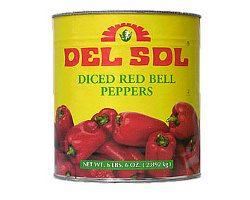 How can I reuse or recycle little tin cans? 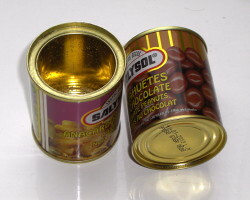 We’ve covered the standard food size ones, but what can be done with little tin cans? John gave a talk at the Manchester Free Software group last month and afterwards we all adjourned to a nearby pub where we found these little nuts cans on our table. 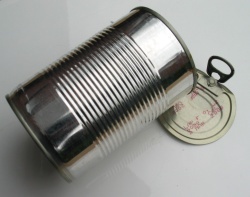 As I’d just been talking about this website to a couple of people, we decided to do a group-think on how we could re-use them but the best we could come up with was a mobile equivalent of a tin-can ‘telephone’ (because they’re more portable). With a couple of holes punched in the bottom, they’d make cute little plant pots – but only for very little plants – so any other suggestions? How can I reuse or recycle food cans? Thanks to the felines, we generate at least one empty tin can a day. Given the size of our kitchen and the delightful pseudo-fishy aroma they tend to emit, we tend to just throw the cans in the recycling bin as soon as they’re empty. But there must be a thousand uses for them. Back in the pistachio shell days, we came up with the idea of using the shells in two cans taped together to make a rattling percussion instrument, so that’s one idea – but I’d love to hear more because a girl can only use so many noise makers.